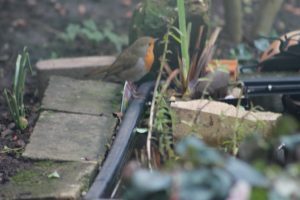 We started this project in August 2016, we are improving the garden, encouraging birds with feeders and nest boxes; a wild life pond felt the next step. We bought an oblong flower pot and some aquatic plants, dug a hole, we then surrounded the pot with bricks and plants. 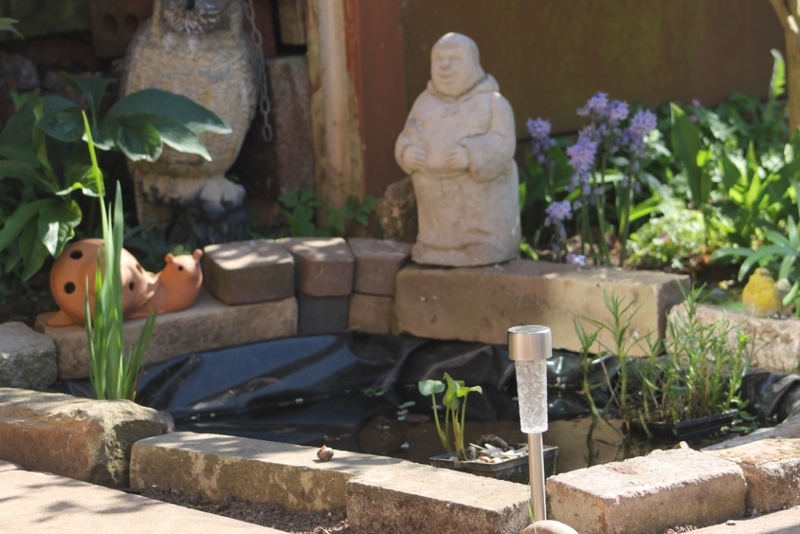 I visited a local garden centre and I noticed dwarf waterlilies for sale, I decided if the pond was successful, I would like to enlarge the pond area so that I could buy a water lily. During the winter and spring we enjoyed seeing the birds drinking the pond water, there was interesting larvae and the aquatic plants were establishing. 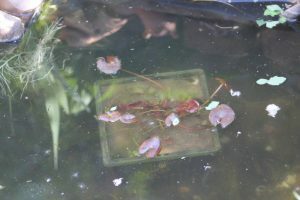 I arranged to pick up some frogspawn in February, we arrived home in the dark, we shone a torch into the water to guide the contents of the bucket into the pond and to our amazement saw a newt swimming round, we carefully placed the frogspawn in. As the tadpoles started hatching out we began planning to make the area bigger. 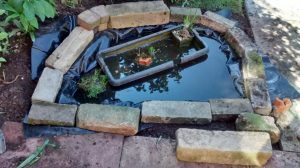 We were given a piece of pond liner, we decided to dig the hole to fit the liner, we wanted a deep part, a shelf for some of the aquatic plants, a beach for amphibians to walk in and out and birds to drink and bathe. 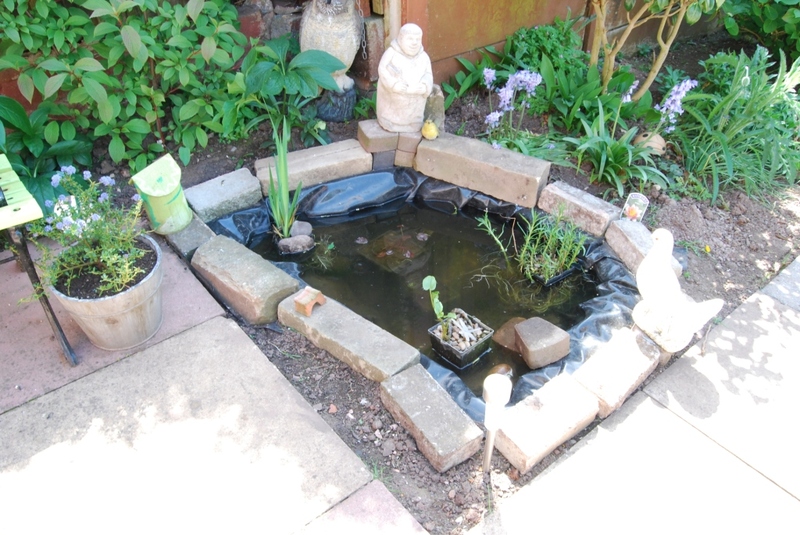 We had considered a preformed pond too. As there were now two newts and lots of tadpoles we decided to place the flower pot pond inside the new larger one. 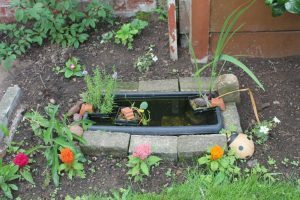 We cut a slot in the plastic pot to allow movement between the ponds. 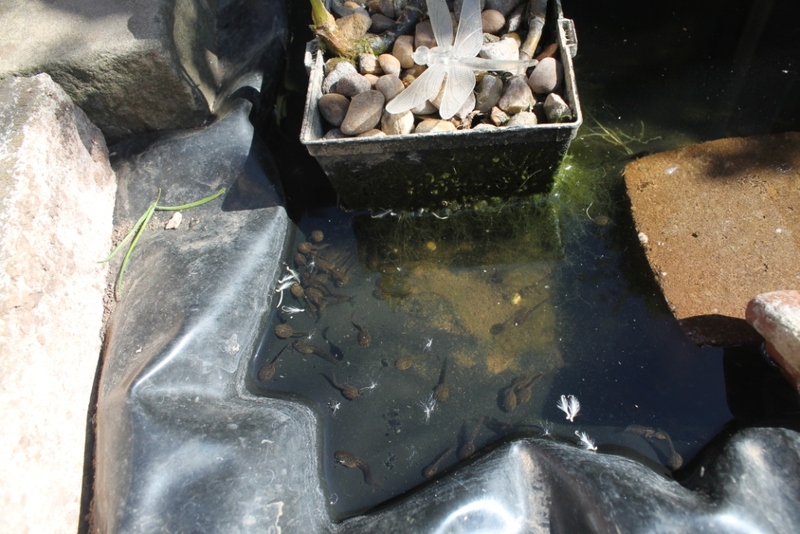 The tadpoles are growing they still have their tails. The Nymphaea Aurora water lily is in position. When we have family around in the summer we struggle to find shade and we obviously don’t want to get burnt. 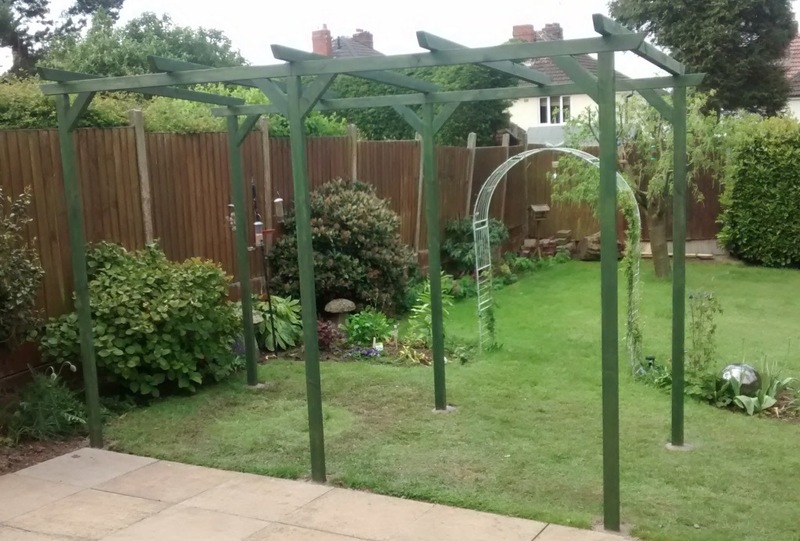 Our garden faces towards the South West so we decided to install a pergola. I’m not brilliant at carpentry but I’m perfectly capable of using a kit, and mixing up some concrete! 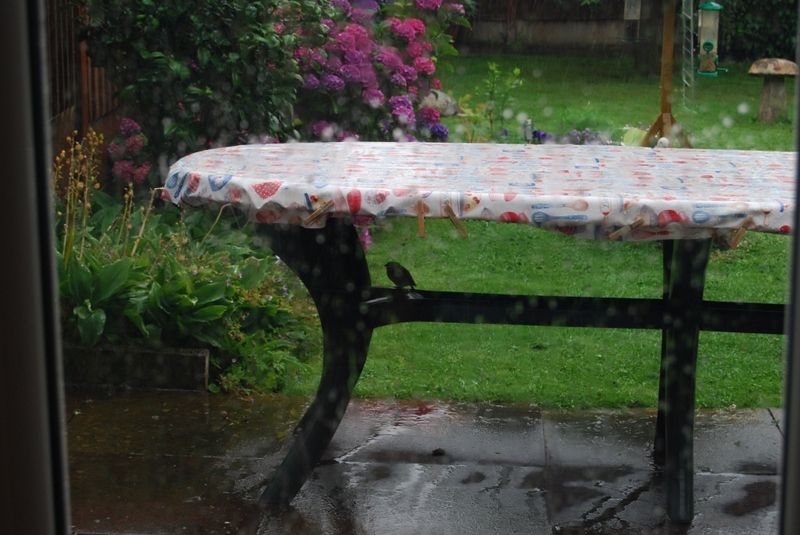 So Jane looked around and found a good deal on Amazon, where we found a 3.6 x 2.0 metre pergola at a decent price. Buying just the timber would have been a bit cheaper at about £2 per metre in Wickes, but then there would be the design and cutting. I also needed an electric screwdriver to easily complete the job and I got a Bosch from Amazon to help me out with that. I didn’t follow the instructions to the letter for the pergola, as I decided to carefully measure out the ground, then put in the 2.4 metre support posts set in concrete in the ground. I then built the two long lengths (sides) onto the support posts, before putting the top rafters in position, all using 100mm screws. The 45 degree supports are fixed into place with 70mm screws. 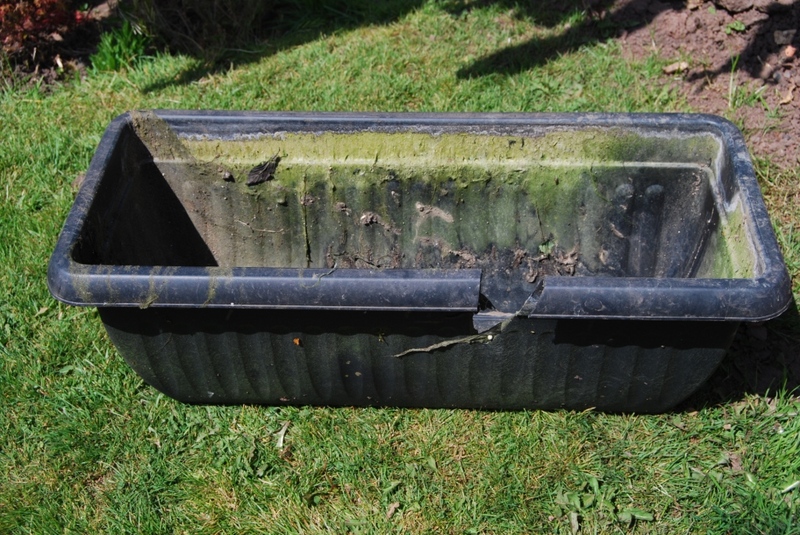 This photo shows the finished article, which we painted with green Cuprinol prior to assembly. When installing a pergola for shade, remember that the shaded area does not fall directly below as the sun is never higher than about 60 degrees in the sky in England. So the shade will always be to the North and East sides of the structure during the afternoons when that shade is to be sought. 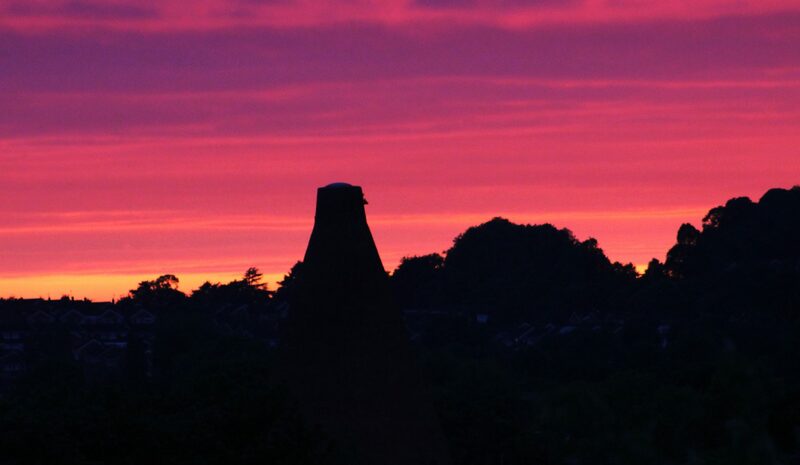 The summer this year, quite similar to last in some ways hasn’t got summery yet. However after nearly 20 years of the oppressive heat of Spain, we are loving the variety of sun, rain, cloud and cool breezes. I have bought a lightweight waterproof coat, but this sparrow has to use it’s feathers and ingenuity.